One of the benefits of a deployment is the extra money (Okay the ONLY benefit of a deployment is the extra money) and they give out a medal too. Each deployed CF member receives benefits such as a deployment bonus, separation expenses (if the CF member is married or equivalent to married or has children) and in certain cases, danger pay. So, my hubby saved up all his money during his six-month deployment and bought himself something special. The great thing about that is we can all benefit…if only I could figure out which one of the 5 remote controls turns it on! It’s great you have your man back by your physical side, (y’know, rather than your metaphorical side…is that the right word?) My guy’s in BMQ right now, and I miss him quite a bit. @ Sasha – I know what it is like to miss your guy. He needs to know you love him and you miss him but he also needs to know you’re strong. Keep busy, learn something new. You’ll have lots to share with him when he returns. @Dawn – You will find support through other military wives. Remember that your relationship is unique so don’t take all of their comments to heart. Ask your hubby to introduce you to other spouses in his unit. It will help you understand the lingo. All the best to both of you! Keep checking back as I’ll be writing more & more! Hey ladies.. being on both sides (both wife and member) and with a multitude of kids, I can tell you it is MUCH easier to leave than to stay back at home… (and my hubby will agree, as he has been at home for 4 of my deployments)… So, you should be proud of your accomplishments to be home alone! It is not easy.. And as our blogger, doing a move by yourself is NEVER easy either. My hubby did it while I was away.. WIth a 2 yr old crying every night for Mommy, as he thought Mommy does not know were we are, we left her behind!! The least we can get in return is a little $$$ to buy a new toy, take a family trip or something that will bring a smile to your kids at the end of the turmoil.. Well done on those of you home alone… You are NOT alone, many other spouses are going through it… ANd this blogger has some excellent hints to make the time pass quickly! Thanks Telah! The support of other military wives helps a great deal both in person and in cyberspace. Thanks for sharing your experiences here. I answer a whole bunch of questions about military life and relocations in this article by Muchmor Magazine. You can download the .pdf version here (14MB). If you are transitioning from the military to the civilian workforce, Audrey Prenzel Career Transition Services will make your transition smooth and seamless. My Virtual Assistant business is Productively Organized. My favourite blog about organizing and productivity is Unclutterer.com. 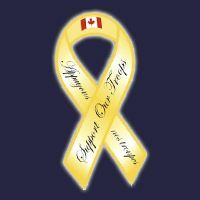 The CFOne card is the one card you need to access programs and services delivered by Canadian Forces Morale and Welfare Services (CFMWS) and the CF Appreciation Program which offers a variety of discounts to Canadian military personnel and their families in recognition of their sacrifices and dedication.